The Milwaukee Brewers have lived on the edge in the 2018, winning eight games on walk-off hits, home runs and walks so far this season. 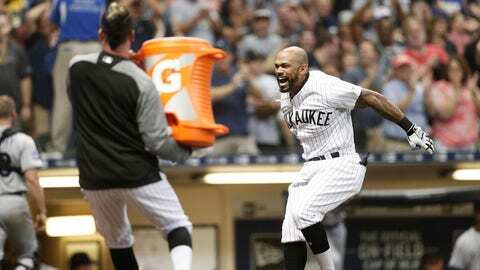 Eric Thames delivered one of the best Friday, hitting a game-winning three-run home run against the Colorado Rockies. Check out his home run below, along with details on all eight of the Brewers’ walk-off wins, and check back often, as we’ll keep updating this page each time the Brewers walk off. The Brewers’ fifth game of the season was a preview of things to come. Christian Yelich — currently mashing his way to the top of the National League — hit a solo home run to tie the game in the bottom of the ninth, before Braun ended it with a solo shot of his own on the very next pitch. Arcia has struggled to stay in the lineup at times this season, but with the Brewers and the Cubs battling atop the division, his walk-off single could have a significant impact on the standings down the line. Arcia delivered with Hernan Perez on third base thanks to a throwing error, giving the Brewers their first win over the Cubs of the young season. Aguilar may be one of the National League’s best sluggers these days, but he’d gone 16 games without a home run heading into this matchup with the Marlins. The future All-Star finally broke through after an impressive 13-pitch at-bat, hitting his first home run of the season. The Mayor of Ding Dong City didn’t bother with a home run with the bases loaded in the 10th inning, driving in Eric Sogard with a walk. Aguilar had already tied the game with a solo shot in the seventh inning when he stepped up with one out in the ninth. He went deep again to end it, hitting his 16th home run of the season and raising his average to .305 through 65 games. Miller made the most of his brief Brewers career, walking on four pitches with the bases loaded in the 10th inning. It was not the prettiest walk-off in Brewers history: Nate Orf was hit by a pitch, Manny Pina hit a single, Keon Broxton walked and Hernan Perez grounded out to load the bases for Miller. Three of the Brewers’ All-Stars factored into this one: Cain, Yelich and Aguilar reached to set up Shaw — who struck out — and eventually Saladino, who lifted one to left field for the win. This one pairs nicely with the Thames cheer song, courtesy of his Korean team, the NC Dinos. Thames launched the third pitch he saw into the second deck with the Brewers trailing 3-2, then did the usual: Bathing in some Gatorade and grabbing the microphone for a celebratory “WOOOOOOO!” during his postgame interview. You know, as one does.